President Donald Trump and Russian President Vladimir Putin wrapped up a historic meeting and press conference in Helsinki, Finland Monday afternoon and addressed a number of pressing issues facing both countries. "Today’s meeting is only the beginning of a longer process, but we’ve taken the first steps toward a brighter future and one with a strong dialogue and a lot of thought," President Trump said. Both leaders started their remarks at the lectern by saying their discussions went well, although serious differences remain. Here are the major topics they covered. "During today’s meeting, I addressed directly with President Putin the issue of Russian interference in our elections," President Trump said. Putin flat out denied his government has ever attempted to influence a U.S. election, despite the Department of Justice indicting a dozen Russian military operatives last week for hacking state election systems, the DNC and stealing sensitive digital documents for publication. 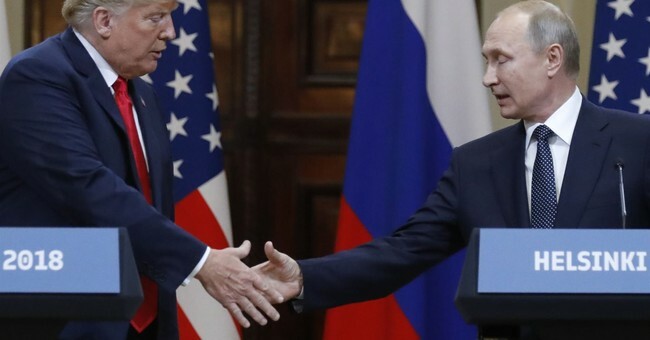 When asked whether he believes the U.S. intelligence community or Putin on the issue of Russian interference, President Trump gave Putin credibility by accepting his denial and failed to accept the U.S. assessment. President Trump was asked about this tweet, which he sent this morning. President Trump was asked about Special Counsel Robert Mueller's investigation into the 2016 presidential election and said it has been terrible for the country. When asked by a reporter if the Russian government had any salacious or damning information about President Trump, Putin laughed. “Cooperation between our two countries has the potential to save hundreds of thousands of lives,” Trump said about the situation in Syria. President Trump didn't call Putin an enemy, but rather a "good competitor" in reference to energy issues in the region. He said there will be competition in the future over gas and oil pipelines in Europe. Near the end of the press conference, Putin handed President Trump a soccer ball and said, "The ball is in your court." President Trump then threw it to first lady Melania Trump, who was sitting in the front row, and said it will be great for his son Barron.